We work with committed employees with excellent skills in a wide range of areas to accomplish our vision that every child belongs to a family and grows up with love, respect and security. 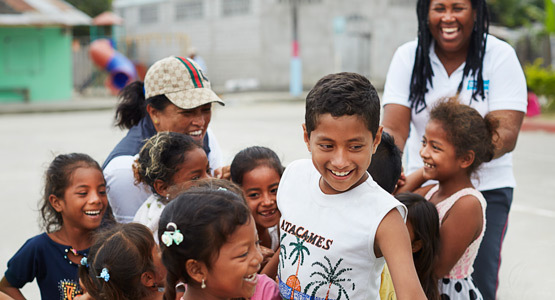 Find out about current openings with SOS Children's Villages International. People are our greatest asset. As an employer, we are guided by the following principles. Our staff feel they are part of the organisation, identify with its values, and share a commitment to children. A professional approach to child care, balanced by compassion and understanding, is promoted. A culture is created which values staff members as equal partners, recognises their contributions, and supports their professional development. People are our organisation's greatest asset, and each staff member is treated with respect, fairness and consistency. Our staff works together as supportive partners, in a spirit of understanding and trust. Teamwork is encouraged to bring new ideas and plans to life. SOS Children's Villages supports the continual development of its co-workers, helping them to improve their skills and professional capabilities. A culture that promotes learning and creativity is nurtured. Individual training needs are assessed, and performance is evaluated, encouraging the long-term growth of each employee. Long service is encouraged, to build experience, continuity and a stable environment in which children can grow. Through strong leadership, effective delegation, and involvement in planning and decision-making, our staff are motivated to take full responsibility for their work, within a clearly defined frame of standards and responsibilities. Initiative and confidence are built, allowing co-workers to act decisively in addressing their daily challenges. Being an SOS parent is a special profession with unique duties and challenges. It is often described as a calling and a vocation, but vocational training is a key step to becoming an SOS parent. If you are interested in an internship with SOS Children's Villages International, please go to our vacancies for current internship opportunities. SOS Children’s Villages International does not run a volunteer programme. Please contact the national SOS association in your country for local volunteer opportunities. Are you looking for the offices of SOS Children's Villages International in Austria?